This week's projects were simultaneously different and similar. They each had their unique challenges, but its hard to grow if you don't stretch out once in a while. 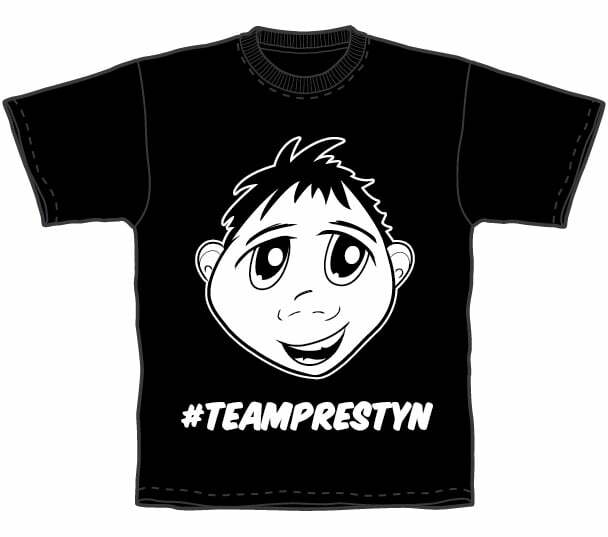 The first project was an illustration for #TeamPrestyn. Prestyn is the son of a former coworker. Unfortunately Prestyn was recently diagnosed with Leukemia. Fortunately for this little guy, he has an awesome group of family, friends and medical professionals who will be by his side on his way to recovery. Prestyn's mom reached out to me to do an illustration for a t-shirt that she planned on having printed and handed out to the group. I was happy to help in anyway that I could. It turns out that Prestyn is a fan of Manga and his mom wanted to know if I would like to do something like that. Now, I'm a white dude in my mid thirties, so my knowledge of Manga is minimal at best. I gave it my best shot, and after doing some research and some sketches, I was satisfied with what I came up with. Most importantly, Prestyn liked it to! My second project this week was a sign for my good friend's basement Tiki Bar, The Rhino Room. I used some packaging material glued to a piece of luan to give the feeling of some kind of bamboo mat or rattan. After gluing up the board and assembling a frame out of some scrap moulding material that I had lying around, I got down to lettering. The material was a little bumpy, so it took a little longer than usual to get the paint down, but patience is a virtue. After the paint was dried, I glued the board together with the frame. I presented my friend Steve with his new sign on Saturday night just in time for his winter warmer party and maiden voyage for the Rhino Room.